Her name is not Clotilda?! 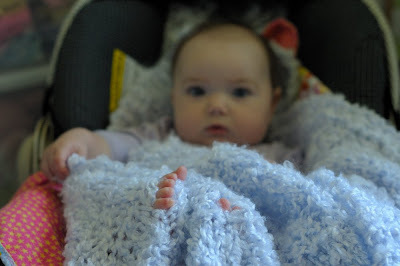 : "I Got Pictures of Your Toes"
So, it's been a bit colder here recently, and to prevent the goose from waking up from your second nap prematurely, I added this blue blanket, which was under the other main "heavy" blanket. Upon her waking, I removed the top blanket only to find the above situation. I had to get the camera...obviously. Hence the little song I made up for her. "I got pictures of your toes...."